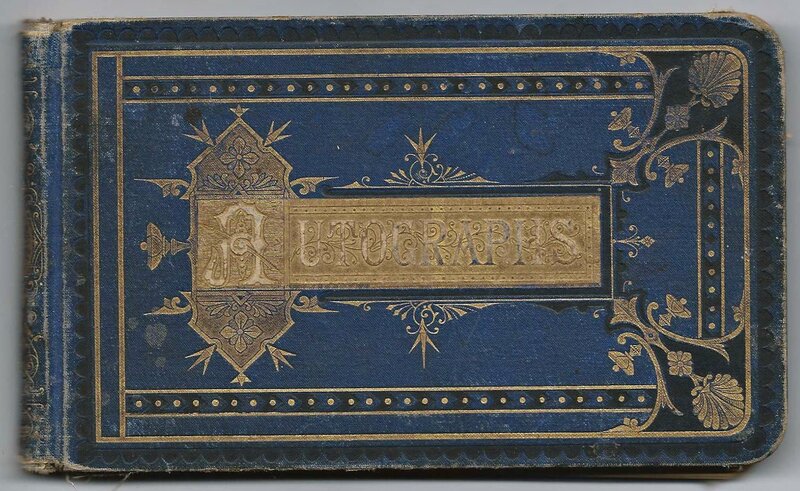 1870s/1880s autograph album of Fred Ames Carleton of South Norridgewock, Maine. He signed his name in three places in the album. The page below is the first end paper. 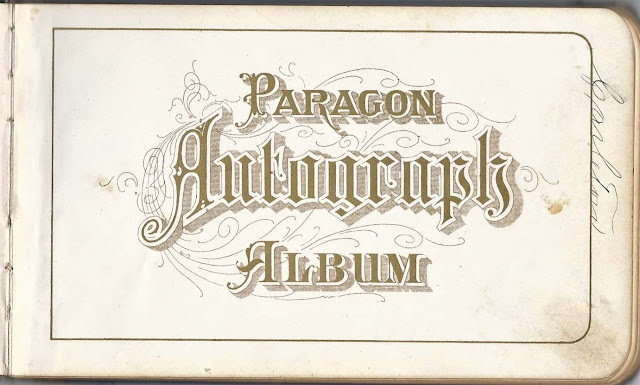 The album is approximately 7" x 4" and contains over 90 pages signed by Fred himself, his relatives and friends, many of them schoolmates at the Eaton Family School at Norridgewock, Maine. An alphabetical list of signers appears at the end of this post. Interestingly, Fred found an empty page facing a page signed by Fannie G. Rogers of Norridgewock, Maine, on 21 July 1879, and signed it on 3 May 1885. Later still, Fannie added to her page, with her new name of Fannie G. Carleton, and dated it 3 January 1887. Fred Ames Carleton and Fannie Gilman Rogers were married at Groveland, Massachusetts, on 26 June 1885. Fred Ames Carleton was born 30 June 1861 at Groveland, Massachusetts, the son of Joseph Frothingham Carleton and Ellen Martha (Ames) Carleton, who were born at Boston, Massachusetts, and, most likely, Norridgewock, Maine, respectively. 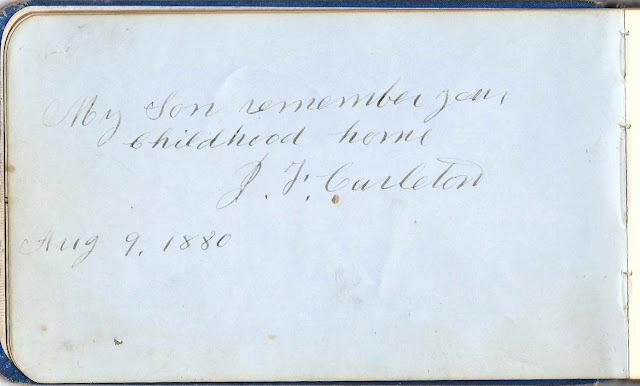 Fred's father Joseph Frothingham Carleton signed a page on 9 August 1880. Joseph's brother John Pierpont Carleton of Cambridge, Massachusetts, signed a page. Fred's paternal grandparents were John George Washington Hancock Carleton and Sarah Pierpont (Coolidge) Carleton. His maternal grandparents were Daniel Stuart Ames and Cynthia (Blunt) Ames. 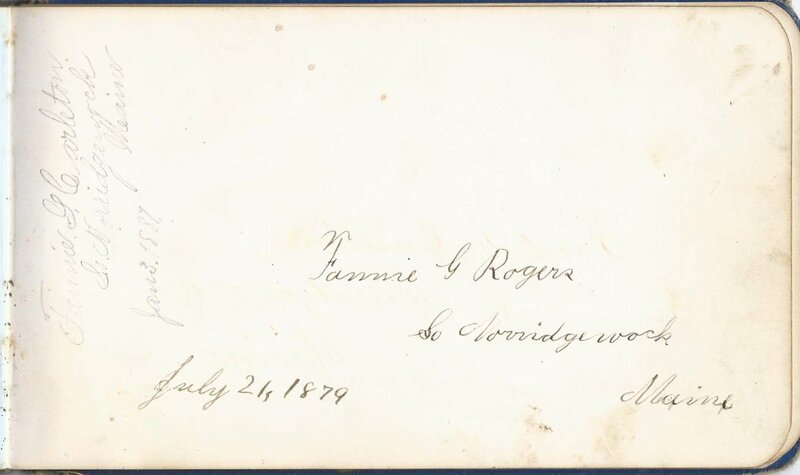 As noted, Fred married Fannie Gilman Rogers on 26 June 1885 at Groveland, Massachusetts. Fannie was born 1 August 1867 at Norridgewock, Maine, the daughter of Ariel Tinkham Rogers and Amanda (Hilton) Rogers. Fred and Fannie made their home at Haverhill, Massachusetts, where Fred was a retail merchant. They had at least three children: Ralph Fred Carleton; George Ames Carleton; and Nellie May Carleton. 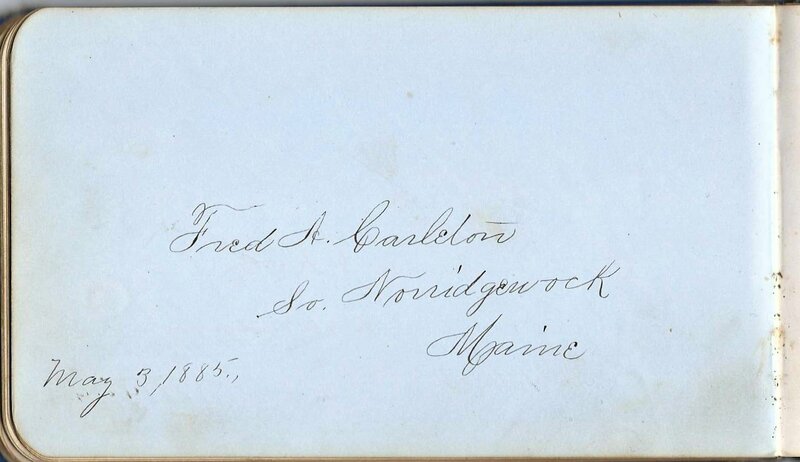 Other relatives of Fred and Fannie signed pages. Many of the signers were students at the Eaton Family School, located at Norridgewock, Maine. Signers came from Maine and other states, including California and Latin America. Aunt Sarah, signed 10 August 1880. Charles C. Ames of Portland, Maine. "Cornballs, Spruces, Shop"
E. H. Bates of South Norridgewock, Maine; signed 3 March 1878. "I will give you your Point." 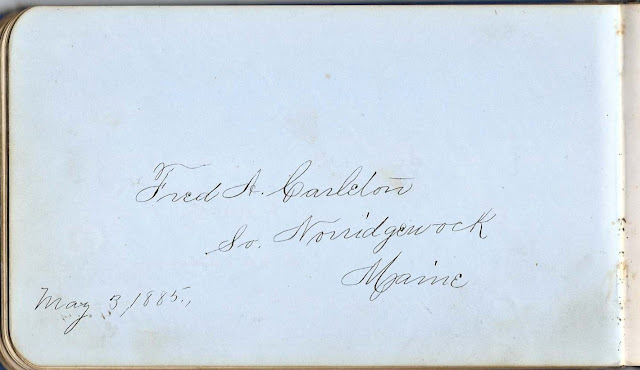 "Youth and Friendship are Eternal"
Fred Ames Carleton of South Norridgewock, Maine, owner of the album, kept while he was a student at Eaton Family School at Norridgewock. He signed three pages from 1876 on. 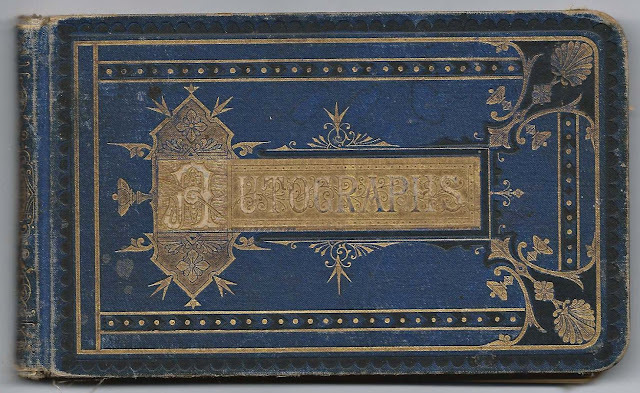 One page he signed was facing a page signed by Fannie G. Rogers, who would become his wife a few years later. A. E. Currier of Toledo, Ohio; signed at Clear Lake, Michigan on 21 September 1882. "Remember the pine woods." Enrique G. de Faldo of Cienfuegos, Cuba; signed at the Eaton Family School in December 1876. Hattie M. Frederic of Starks, Maine. Written at the time or possibly later: "Where is the wood sawyer? Spring of '85"
W. E. Leeman of Deadwood, Dakota Territory; signed on 27 February 1880; now Deadwood, South Dakota. He may have been the William Elvin Leeman, born in Maine, who had a carriage, sign and ornamental painting shop at Deadwood. His wife, Bertha Schofield (Winn) Leeman, was also born in Maine. 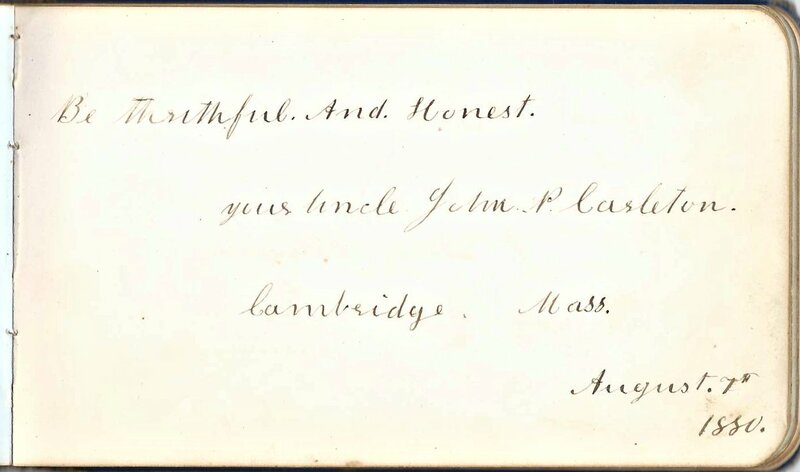 P. S. Lindsay of Norridgewock, Maine. "Pull the plug $25.00"
Manuel Morocha of San Jose de Callao, Punta de la Arena, S. C., and Canton, Cuba. Manuel wrote a naughty bit in Spanish. Mrs. Sophia Putnam of Battle Creek, Michigan; "be a good boy"
Alice Mae Rogers of Norridgewock, Maine. Younger sister of Fred Ames Carleton's future wife Fanny Gilman Rogers. Clara A. Rogers of South Norridgewock, Maine; signed 4 July 1879. She was Clara Amanda Rogers, older sister of Fannie Gilman Rogers. Fannie was the future wife of the album owner, Fred Ames Carleton. 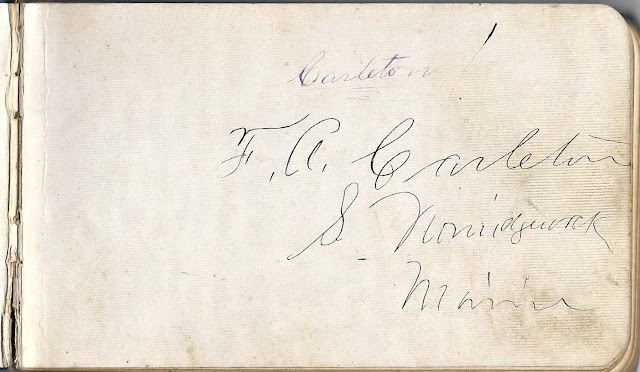 Mary Addie Smalley of Spencer Creek, Michigan, in Antrim Co. She signed another page as well. James W. Taylor of Norridgewock, Maine; signed 1 January 1877; "Remember the days of 1876." Zettie A. Wood of Norridgewock, Maine; signed 15 January 1877. "Kind words never die."